Windansea Beach is a stretch of coastline located in La Jolla, a community of San Diego, California. The neighborhood adjacent to the beach is named Windansea after the beach. It is named after the 1909 oceanfront Strand Hotel that was renamed "Windansea" Hotel in 1919 after the owner Arthur Snell ran a "naming contest". The Windansea Hotel which was located on Neptune Avenue between Playa del Sur and Playa del Norte burned down in 1943. Geographically, it is defined by the beachfront extending north of Palomar Avenue and south of Westbourne Street. The main peak at Windansea is a reef break. During the winter months, Windansea can have six-to-eight foot surf. Other breaks in the vicinity of Windansea include Middles, Turtles, Simmons (named after Bob Simmons who died at that break in 1954) and Big Rock. The distinguishing landmark at Windansea is a palm-covered shack that was originally constructed in 1946 by Woody Ekstrom, Fred Kenyon and Don Okey. 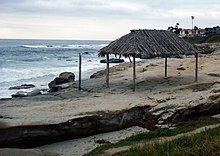 "The Surf Shack at Windansea Beach" was designated as an historical landmark by the San Diego Historical Resources Board on May 27, 1998. The shack was struck down by large waves during a high tide on December 24, 2015 but rebuilt by locals in June 2016. The Windansea parking lot is located along Neptune Place, between Nautilus and Bonair Streets. Although recently upgraded by the City of San Diego, it offers a limited number of parking spaces. Street parking is typically widely available. There are no drinking fountains, showers or public restrooms available. Windansea enjoys a storied reputation as a surfbreak, and has served as home break to many notable surfers, including Mickey Munoz and Butch Van Artsdalen. Steve Pezman, former publisher of Surfer magazine and current publisher of The Surfer's Journal, called Windansea locals in the early 1960s "the heaviest surf crew ever." The Windansea Surf Club featured was founded by Chuck Hasley in 1962, and included members such as The Endless Summer star and first Vice President Mike Hynson and Skip Frye. In 1963, Michael Dormer and Lee Teacher built a six foot, 400 pound version of their Hot Curl cartoon character out of cement, iron, a mop, a light bulb, and a beer can. The statue appeared on the rocks over Windansea beach in La Jolla, holding a beer in one hand while gazing out over the ocean in search of the perfect wave. In 1964 Hot Curl was featured in "Muscle Beach Party" starring Frankie Avalon, Annette Funicello, Buddy Hackett, and Don Rickles. This page was last edited on 13 September 2018, at 01:00 (UTC).